Necessity is a mother. 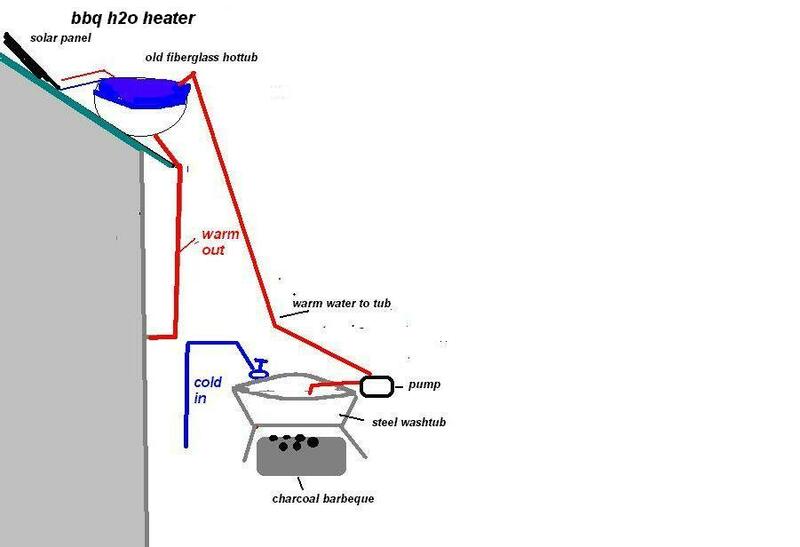 Constructed in response to a failed and leaking gas waterheater, the two experimental models below worked, but need refining to reach optimum effectiveness. The hot water tank is an old fiberglass hot tub I had lying around. It holds about 30 gallons. It is mounted on the roof so the warm water will gravity feed into the pipe system in the house. A swamp cooler pump is suspended so that the pumping shaft descends into the water. It pumps water from the tank to the heating panel where it gathers heat and returns to the tank. The pump is on a timer so that it runs only during daylight. A photoelectric switch could be used as well. Water is fed to the tank through a float valve to replace water used. The solar panel consists of several lenths of plastic pipe, painted black, inside a shallow box. Its top is an old glass window in its frame. The bigger you can make this, the better it will work. Mine is about 2 x 4 feet. It works as long as outside air stays above about 70 degrees F. (about 21 C.) Gravity feed results in lower water pressure, but it's adequete for a shower. It doesn't use up the warm water as fast, so you can take a leisurely warm shower without running out. This system is a modification of the first to cope with chilly winter conditions. Winter in Phoenix often sends night-time temperatures down to 40 F. (4.4 C.), reaching no higher than 65 F. in the daytime. With a much larger panel and a heavily insulated tank, solar heating might still work, at least on sunny days. But barbequing is sure-fire. To get the water up to the roof I used a more powerful pump, a small one with garden hose connections, meant for draining basements or pools. The bottom of the tub should be supported just above the barbeque. Covering the tub during heating helps. When the water is hot, turn on the pump and send it to the roof tank. The empty tank will cool the water somewhat. 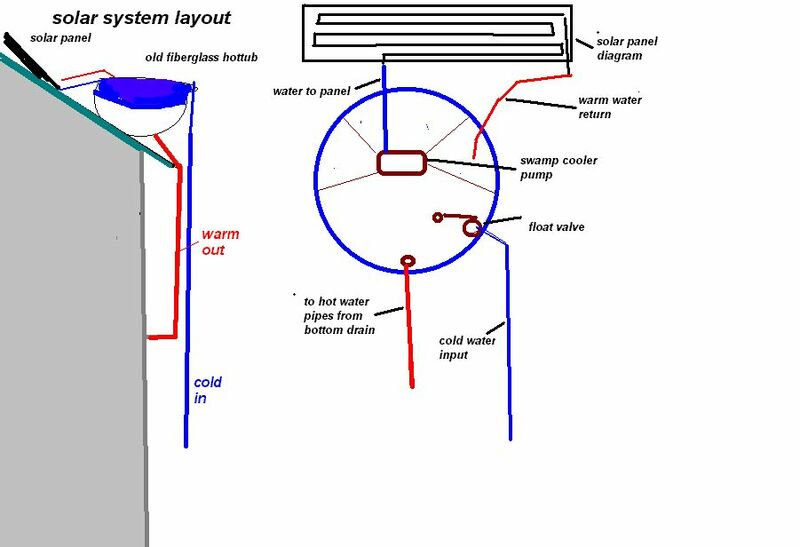 These systems were experimental and built for a cheap temporary solution, but the principles work, and if refined and enlarged, could be permanantly used as a power-saving hot water system.